← What can you do with EMC Enterprise Hybrid Cloud? Once to be in the form of energy, mass is not indestructible but can be transformed to other forms of energy. This happens when subatomic particles collide, particles can be destroyed, and their kinetic energy in the masses can be used to form new particles. This creation and destruction of material particles is the stunning result of mass and energy equivalence. They form dynamic patterns in the fourth dimension of space-time making everything connected at the subatomic world. That I learnt in school. Being raised as Hindu and adding my own nerdy inquisitiveness, I know that the Lord Shiva as dancing Natarajar, His “ananda thandavam” or “dance of bliss’” is the creation of universe. His upper left hand holding a small drum symbolizes “creation”, fire on the upper right hand symbolizes “destruction, the second right hand showing “abhaya mudra” symbolizes “protection”, the second left hand pointing to his feet represents “salvation and grace”, and all these happens in the ring of fire around him that represents continuous cycle that holds all the four said representations in the universe. He dances on a small demon “muyalakan” who represents “ignorance”. Altogether the iconography represents if you put your “ignorance” at God’s feet, He’ll protect you from the continuous cycle of creation and destruction, and leading up to salvation. 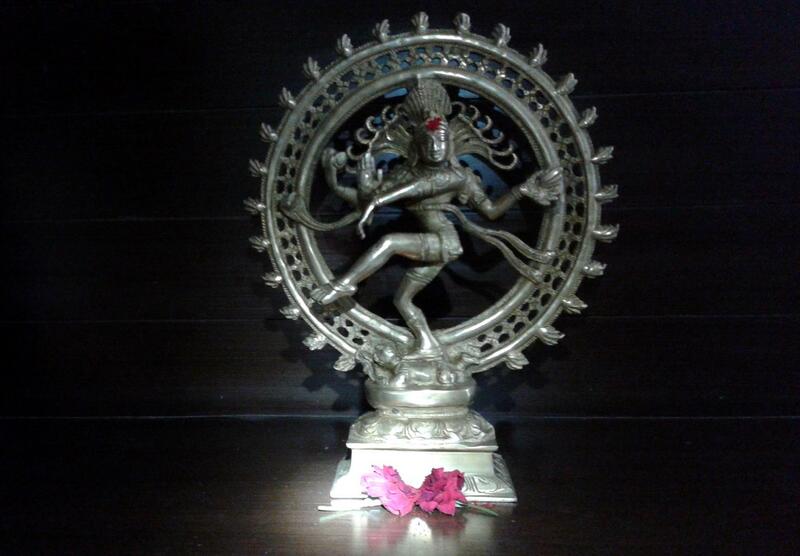 Indian government acknowledged the insightful significance of the metaphor of Shiva’s dance for the cosmic dance of subatomic particles, which is observed and analyzed by CERN’s physicists with a 2m tall statue of Natarajar in 2004. Here is my own to remind my future family and me of the deep and profound cultural and heritage roots in Tamil and India. This entry was posted in General, Philosophy and tagged Bronze, History, Natarajar, Particle Physics, Tamil, Theory of Relativity. Bookmark the permalink.